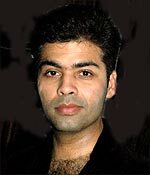 Karan Johar, one of the most successful directors in India with all the four films directed by him starting with Kuch Kuch Hota Hai in 1998 is a super hit, was in America recently for the launch of the international edition of his biggest, My Name Is Khan. But directing films is one of his several passions, he says. "I like to see directors and writers get a break through the films I produce," he says. Though the films directed or produced by him have featured some of the best known artists in India including Amitabh Bachchan and his son Abishek, it is his association with Shah Rukh Khan, who is there in the lead in all four films directed by him, has made movie history. "When Karan says he has a film for me, I don't even ask for the script," Shah Rukh has said. When My Name Is Khan opened over two months ago, there were some people and trade analysts in India who wrote that it had collapsed in the second week. The film has grossed over $39 million worldwide; it is the highest grossing Hindi film outside India. We may reach $40 million. It is doing great as a DVD despite piracy in India. We have added over 20 minutes of deleted scenes. Much of its success came from abroad. Yes but it is also a huge hit in India. It was particularly strong in the United Kingdom grossing over $4 million. In fact, in the United Kingdom the three top-grossing films are directed by me. MNIK did better business in the UK than 3 Idiots. And MNIK is still running in more than 100 theatres worldwide. We have just opened the international director's cut in America targeted at the non-diasporic audiences in America, showing the film first in New York and Los Angeles, and if it does well, expanding it to other cities. What is the big difference between the director's cut and the standard edition? [Chuckles] Fox Searchlight (the international distributor for the film) has edited out nearly half an hour from the original and they have done an excellent job. I was fully aware of the process and I was pleased to see the new version. Brevity may not be my forte. It is theirs. We are surprised that it did beyond our expectations. This is not the usual masala film. This is not even a typical Karan Johar film. It is more thought provoking and deeply psychological film than anything I have done before. As I have said before, making this film make me grow more as a person than ever before. What did Fox Searchlight do to this film that an Indian distributor could not do in the foreign markets? Because of its vast network, Fox was able to show this film in the best of the theatres worldwide from Canada to Poland to Indonesia. Even in countries where Indian films are very popular but not well distributed, Fox did a remarkable job. From Egypt to Jordan to Malaysia, the film has performed strongly to a large extent because of the Fox distribution strategy and its ability to engage leading film writers in various countries to run stories on My Name Is Khan. What are some of the territories have surprised you? Indonesia, in particular. If a Hindi language film grossed about $75,000 there, it is considered excellent but our film struck a chord, and it became a sleeper hit grossing over $1.6 million. In many Muslim countries, people were moved by what this film is trying to do: to remove a generalized, stereotype depiction of a religion. But extension, it speaks for any religion that is misunderstood an vilified. It offers a human message and it touches your heart. I believe the film is enjoying a good run in Poland. It grossed about $75,000 in its first week which is very good for a territory like Poland. I believe the second week is even stronger. Playing a devil's advocate. Why would anyone care to see your film in Poland which has no history of watching Hindi films in big numbers? My Name Is Khan is about humanity. It is a film about times and unfolds against the background of today's headlines. But above all, it is a film about the triumphant of goodness. Are you working with Fox soon? Right now I don't have any project but who knows what could happen tomorrow? Fox welcomed Dharma Productions and me as if we were family members. And surely if there is a project that interests a Hollywood studio, Fox would welcome us again. That is our pride. Last year we made Wake Up Sid directed by Ayan Mukherjee. Soon we have Punit Malhotra-directed I Hate Love Stories with Imran Khan and Sonam in release. I believe it is a sweet and funny film. What is I Hate Love Stories about? It is about this guy who hates Hindi movie love stories. But he can't believe that many things that happen in these films are happening to him in real life. And the movie becomes a quintessential love story. You don't shy away from discussing your hits and flops. What do you think went wrong with Kurbaan which was also the first film directed by Rensil D'Silva? It came soon after another film dealing with the aftermath of terrorism in America was released and became a hit. Though Kurbaan was different from that film, still the audiences were hesitant to go and see it. Perhaps we should not have given it a wide release like showing it in over 300 theatres in the first week. The film might have worked better had the word of mouth had time to grow. You have also said that as a producer you too take personal responsibility for the film's failure. I feel that I wrongly projected the sexual violence as opposed to the emotional violence of the story. And yet the failure of the film surprised all of us. We still hear from people, not only in India but also in the Middle East, America and the United Kingdom who loved the film. But over all, the film did not take off. What else have you learned from the reaction to Kurbaan? I believe it is more important to accept the failure of a film than accept a success. For from failure, you learn a few things. But I also believe that one should never let a failure change one's outlook, as long as it was a credible failure, and Kurbaan was one such film; never to let the failure eat into your heart. We are proud of the way the film was shaped. What else among Dharma Productions movies would you consider an honourable failure? More than two decades ago my father (Yash Johar) produced Agneepath which did not do well. It was also a credible failure. Dharma productions soon launched another film. There was no time to mourn the failure. I always remember my father's attitude. Amitabh Bachchan speaks very proudly of the film, and recites dialogue from it at his live shows? Yes, he has told us again and again how dear the film is to him. And that is one of the reasons he has continued working with us. People still remember your father decades after working with him, and many years after his death. Waheeda Rehman speaks about him as they are still friends. My father was the production manager on Dev Anand's Guide (one of the best-known films starring Waheeda and made in the late 1960s). He played an important role in making the film what it is. You have spent quite some time in recent years writing stories for films directed by others for Dharma Productions. When are you going to direct your own project. I would say, soon, say after a few months. But I don't have any subject in my mind. I am using my sojourn in America to think about my next. What kind of film are you inclined to make? I think it would be a fun-filled film. It does not also have to be a film with many stars. But who knows? Beyond that I do not have any clue what the film is going to be, and where it would be made.